Have you noticed a drop in your likes, comments and shares on Facebook? Have you noticed a drop in traffic to your site from Facebook? You are not alone. It’s okay now. Shhhh. Don’t panic: there are other ways to promote your products and services online. Before you all out panic about your carefully developed Facebook following, about your minutely planned strategy and ALL. THAT. EFFORT. hold this thought dear to your heart: it’s not just you, it’s all of us. All companies who have been leveraging Facebook’s resident audience, with long-term or short-term strategies, all of them are feeling your pain. Big or small, all business users of Facebook are now obliged to re-assess their relationship with the platform. A number of significant events in the last 12 – 18 months have seen dramatic changes in Facebook, how its algorithm operates and how those changes are effecting user behaviour. As mentioned above, the last 12 to 18 months have been among the most tumultuous in Facebook’s short history. Between the Cambridge Analytica scandal and it’s following #DeleteFacebook movement, the General Data Protection Regulation and the awareness it raised among users about the value of their data and Zuckerberg having to change out of his t-shirt into a suit to appear before a committee in the US to answer questions about Facebook’s role and responsibility in possibly affecting political change…. I’m exhausted writing that paragraph, never mind having to deal with it. To give you an idea (and to introduce you to an excellent podcast), Radiolab broadcast a recent episode about how Facebook manages their flagged content in particular. This is about the manner in which Facebook deals with content that the community has flagged and how that process has evolved over time and, indeed, space/ place. No matter the organisation or the sector, all pages are seeing a drop in their traffic from Facebook and in user activity on their Facebook pages. So what’s a girl/ guy to do? How should your business react? If you are pretending that you can’t see those questions by sticking your head in the proverbial sand, it’s okay. You can turn over a new leaf anytime. In truth, you could have been acing the Facebook game until now and you would find yourself in the same boat as someone who was floundering because the current state of flux is affecting all users. One option is to shift your attention elsewhere. You can, of course, rejig your strategy for another platform. Instagram is where it’s all at these days which is ironic as it also belongs to Facebook. There is no doubt that Instagram is a very enjoyable platform for the user. Born mobile, Instagram’s developers understood and understand enough about that shiny object that you always keep at hand to make sure Instagram zings on your phone. But it is a highly problematic platform for a business. Sure, anyone can start posting but the pressure for presence of a high quality, AND to be entertaining, useful or amusing is greater than many other platforms. The resources required to achieve success for a cash-strapped start-up or smaller organisation may be unreasonable. Not impossible but there is a high bar on this platform. Why does a business use online marketing? To drive leads and customers to engage with them and buy their products or services on their own site. Preferably this will happen on a landing page that is either unique to that platform or at the very least includes an unique identifier in the URL. Starting out on Instagram you have one place where you can include a link: in your bio. Sure, you can change that link everyday. But this cumbersome, especially for a small company with too few heads for all those hats. There are any number of services to create a responsive landing page for your Instagram traffic. To drive your Instagram followers to unique landing pages from your Stories, you need at least 10,000 followers. Or you need to be famous or just Instafamous. (Hence the rise of influencer marketing.) 10,000: That is an overwhelming and somewhat arbitrary figure. For an organisation with a very small or no marketing function it can seem well nigh impossible. Maybe this is part of Facebook’s plan for Instagram: fish in the deep waters for the whale. Don’t bother with the thousands of minnows. Why waste resources on making it easy for smaller players to use your platform? If you are happy to pay for the platform through advertising, the world is your oyster. As a business owner you understand, of course, the value for Facebook in focusing on, let’s just say, the 10% of their customers who generate the 90% of their revenue. However, like all platforms, if the broad demographics of a platform encompass your customer’s demographics, it may be worth investing the time and some of your advertising budget building a community on the platform. If your blogging game is on point, you should be able to adjust to a platform that is new to you or lesser used by you. Writing a blog-post will help you think of visuals and hone your hashtags. Strong branding will allow you to convert that blog-post to video or ebook or images and maintain brand awareness. Split your blog-post into snippets and share, day by day, across LinkedIn, Twitter, Instagram, Pinterest and sure keep on keeping on with Facebook. You may find that, despite all the changes, that Facebook is still your strongest referrer. In the meantime you are gathering data about what works where and you are adding to your keyword rich content on your own site. If you have not tried a platform for your business at all, by all means grab your company handle on the platform, but, for the first month at least, develop your personal profile on the platform so you can get a feel for the interface, the tools and the possibilities. As my social media mentor Krishna De always says, “You wouldn’t take off in the car without lessons, why would you take off on social media (with your business in the boot!) without practice?” So practice on that personal profile first. Fail better there! Nothing is unfixable and so much media is “disappearing” nowadays anyway but you don’t want your business to come across like someone’s granny on Facebook. Remember to adjust your media for other platforms. Images and Videos created for Facebook or YouTube may not work on Instagram and LinkedIn. Yes, they may have different formats but also think about the user: why, where and how are they consuming your content? So if all those users are pulling back from Facebook and Instagram and detoxing from Twitter then how are they finding out about products and services? Search is where! People still need to find the perfect present for their mum (especially my children!) or night courses or hotels. They may get referrals from their peers on social media or WhatsApp but if a user with 30.1K followers only gets 4 responses (at time of writing) to a request for recommendations on Twitter then she is going to turn elsewhere. Where? The answer is still Search! So keep writing that content stuffed with keywords. Keep updating your site to respond to search. Learn what your analytics mean and keep an eye on them. That’s your long game. You can play the short game too and spend money on Google Adwords. Do your homework first: pinpoint your objectives, develop your customer persona, create copy that addresses their needs and adsets based on their demographics. A well optimised site will not only make the users’ experience more pleasant it will pay back tenfold in data in your analytics. A well structured site will allow you to up your remarketing game post-GDPR. You won’t need email lists for remarketing if you know what content your visitors have been reading and that content is written with intent. Your customer’s intent! Facebook is nothing if not competitive. Their biggest competitor for our online eyeballs? YouTube. They have made no secret of their desire to grab some of the airtime. YouTube’s recent introduction of vertical video format hot on the heels of the launch of IGTV (or was it the other way around?) is solid proof that this is a competitive space. Make the most of that and the free tools available from those platforms and other service providers who are all chomping at the bit to get User Generated Content (UGC) to keep the viewing public happy. Television stations have advertising and licence fees to allow them to create content; Facebook and YouTube have us. It is really worthwhile investing in the services of a professional. Amelia Caulfield has recently done some great work with a client and I’m also happy to recommend Go Motion who offer training as well as video production services. The reason I founded OnlineHub.ie is because I have always believed that every organisation needs their own online hub. I believe that the only way you can weather the storm is by understanding your customer and responding to them in a professional manner. Yes, you can be lighthearted, fun and friendly if it matches their expectations of your product or service. (i.e. funeral directors, not so much) If you can always point them in the right direction on your site, that site will also respond to search on and off the networks. 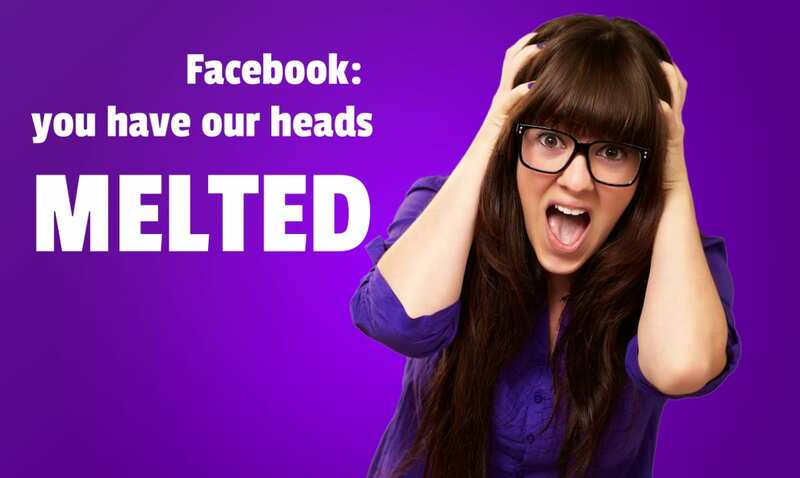 Have you also experienced a drop in referrals from Facebook? What have you been doing to adjust? I’d love to hear the tips and tricks you are using to address changes like this. Thanks!